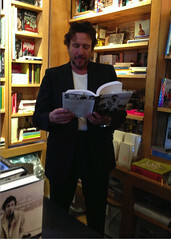 Well, it is officially Richard Hell month. His newly published book, “I Dreamed I Was A Very Clean Tramp,” has enjoyed a glowing review in The New York Times. There has been a flurry of personal appearances in bookstores and a string of interviews in print outlets and on the radio. It has probably reminded this self-deprecating and essentially very private man why he dropped from the public eye to begin with. The tension between his introversion and the will to perform has always been Hell’s biggest conundrum. And what better way to help relive that dichotomy than a book tour? Maybe it’s a form of therapy. We have the feeling he would rather chew glass.